Our experts bought and reviewed 8 different brands. We spent two weekends camping (it’s a hard life!). We’re confident we’ve found the best popup gazebo with sides available on the market. Anyway, a good gazebo should protect you from outdoor unpleasantries: sun, rain, and bugs. All airwave gazebos on this list achieve this. One of the best designs and most pleasant to stay in was the Airwave 2.5 x 2.5m Pop-up Garden Gazebo. On a strict budget? Check out our best cheap gazebos. 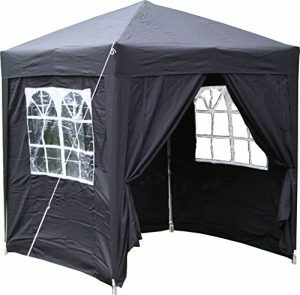 The Airwave 2x2m gazebo is a small waterproof canopy (with side panels). 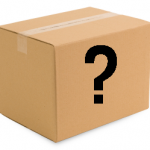 It has always been a very popular item sold by ECS Ltd, the owners of the Airwave brand. The size of it makes it ideal for garden use and with the sides attached it’s ideal for extra privacy, should you require it. Perfect for keeping prying eyes from those nosey neighbours away from your function. It’s equally effective at keeping drafts out when it drops a little cooler once the sun’s gone down. You will receive everything you need and exactly what is shown in the very top image. 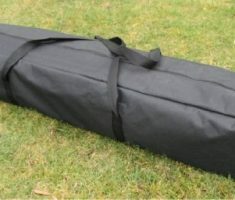 It has a decent material weight of 190g PU, which will ensure that your event and guests will stay dry in wet weather. 190g PU means that for every sq metre of fabric it will weigh 190 grams. It’s then coated with a polyurethane coating to one side of the material (Outer) making it water resistant, lightweight and flexible. Is this Airwave gazebo ok for Private Events? Quite often, most gardens in the U.K are overlooked by another. Therefore, the inclusion of 4 sides, 2 full-length zipper doors, and 2 with windows ensure those prying eyes are kept out. This will make your event much more private. This small gazebo is very versatile. The 2m by 2m size means its easily portable from event to event whilst also meaning that it can easily be built by 2 people. How Strong & Sturdy is it? You’re buying a strong, compact enclosure that can resist heavy rain and moderate breeze. To achieve full structural strength always use all parts provided and ensure that it’s constructed correctly on a flat surface. Due to the small size, it is never really going to be too expensive because there are fewer materials involved. However, it is clear from the manufacturers (ECS Ltd) that they clearly wanted to ensure you had a low price outdoor shelter but weren’t prepared to reduce the quality, strength or versatility of it. I’m pretty sure you’ve already decided on what type of event you plan on using it for but here are a few more ideas for alternative uses. 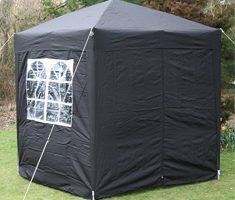 This Airwave 2x2m gazebo ensures that your party goes ahead even in unpleasant weather. 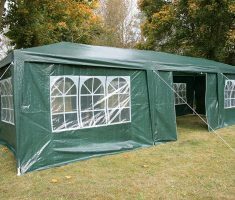 A very low price, combined with a decent range of colours and surprising strength will ensure you have adequate shelter for your outdoor events. These types of products don’t last forever but they will last long enough providing you look after them and you’ll definitely get your money’s worth. You can comfortably expect a minimum 2/3 years worth of use out of it. Looking for a slightly bigger model then check out the 2.5 x 2.5m version by Airwave below. 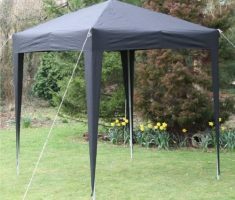 If you’re looking to buy an Airwave gazebo then this 2.5m canopy could be perfect, especially if you’re looking to use it during the spring and summer months. This enclosure is a great choice when it comes to buying a reliable and multi-purpose shelter. The rare size (2.5×2.5m) is actually a very popular choice and as it’s waterproof it’s great if the weather turns a little unpleasant. There are lots of great features as you can see listed below or you can take a look at the Amazon reviews and product listing for yourself. The reasons to buy are very similar from one enclosure to the next but here are my reasons to buy this particular size. As with a lot of outdoor products that are coloured there is a chance that prolonged use in very sunny conditions may cause the colour to fade slightly over time. Don’t worry though, as this happens to most products of this nature over time. This waterproof enclosure is great at withstanding heavy rain and breezy conditions. The canopy and sides are both made from very waterproof fabric (190gsm) that ensures any rainfall just runs off. 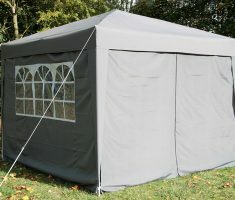 The fabric of the canopy is manufactured from 190g PU coated soft touch polyester and the seams are taped sealed to prevent any leaking around the stitching. How strong is this 2.5m gazebo? The frame is made from galvanised steel which ensures it is capable of resisting breezy weather, along with heavy downpours. The frame and roof struts are powder coated which ensures the prolonged longevity of your pop up gazebo with sides. Is It Easy to build? If you’re looking for an easy to assemble shelter then this product is ideal. With 2 people assembling it can be built in as little as 2 minutes. Be careful whilst building it in windy conditions though, as the wind can make it a little bit tricky. All the contributing features and materials ensure that the final product is of good quality and won’t let you down. It is very well-made, from the waterproof canopy and sides, the galvanised steel frame, right to the additional accessories that come with it (leg weights, carrying bag, guys and pegs and the windbar). The premium quality fabric used in making the roof, sides, as well as the steel frame, really do ensure that this item is head and shoulder above most other competitors on the market. It really is a well-made product that will last much longer than those of a similar price. The price of this product and many of the other Airwave products ensure that outdoor canopies can be bought whatever your budget, large or small. It’s very affordable and comes with a lot of great accessories that, as mentioned above help it last much longer, whilst also offering you peace of mind that you’re using and owning a decent and robust product. 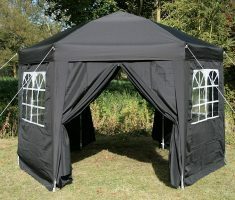 You may well be aware by now I strongly recommend this 2.5m pop up gazebo with sides for general and regular use. 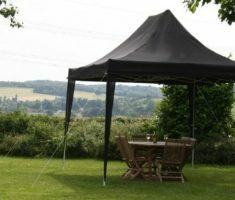 With its ability to resist breezy conditions, as well as its ability to keep you dry, there couldn’t be much more you could really ask from a pop-up gazebo. Looking for a slightly bigger model? Then check out the 3x3m version by Airwave below. 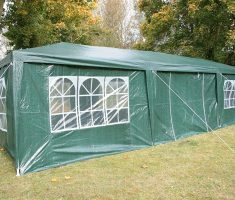 The Airwave 3x3m is excellent for providing a protective enclosure to not only keep you dry but also against breezy conditions. 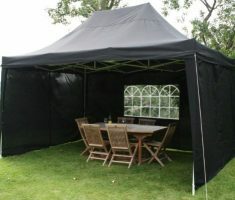 With its waterproof canopy, it can also resist wet weather and let the party carry on regardless of the weather outside. Alternatively, in the summer months, its ideal for use as a hot tub gazebo as it can provide lots of privacy just by undoing the tie backs and closing the drapes. A 3x3m gazebo might not sound massive, however, once erect and with your desired furniture inside it, you’ll be surprised just how roomy it is. Allow an extra metre of space around the perimeter to allow for the guy ropes to be staked into the ground for extra strength and stability. 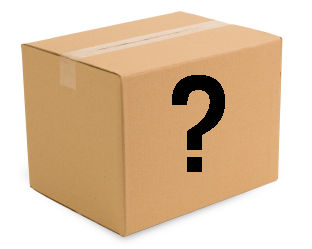 Below I have listed all the parts that are included when you purchase this product. This fully waterproof pop up gazebo with sides really does offer great flexibility for your event. It means basically, that if the weather takes a turn for the worse then your party can carry on regardless. The fabric is 190gsm, which means every square meter of fabric weighs 190 grams and then a waterproof PU coating has been applied. This ensures the rain water just runs off. 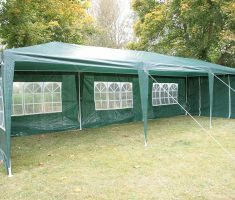 Equally, if the wind gets up you can easily add some of the side panels or even all of them to ensure your event is much more protected from the elements. The concertina frame makes this simple but sturdy product, very easy to build. It’s merely a case of 2 people walking back to stretch out the frame and then lifting it to the desired height where it just clicks into place. It’s equally as easy to take down and you can leave the roof canopy attached which makes packing it away far easier and also easier to store. Not only is it simple to build, it is also very easy to transport around in the carrying bag provided. A combined total weight of 20kg and a handy carry bag to have it in makes it easier to carry and much tidier. The bag is also water resistant. This 3x3m gazebo is an extremely popular choice when it comes to outdoor canopies and enclosures. It’s got everything you’d expect from a waterproof shelter and can be used for lots of outdoor leisure activities. There’s not a lot more to say apart from that this is another decent Airwave gazebo that can be bought on Amazon. There is a 3x3m version without sides that is available. But for the price of it compared to the one with sides then we don’t see the value in buying the one without the side curtains. This hexagonally shaped gazebo is ideal especially if you’re looking for a fairly large gazebo to use for garden activities or to take away on holiday. This type of gazebo is fast becoming more popular for a wide range of reasons. 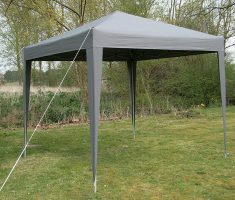 Its hexagonal design offers more strength as it has more poles and struts, however, as it’s a pop-up gazebo, it’s still erected exactly the same, just by stretching it out and popping it up. When this unique hexagonal style came on the market it was a refreshing change, to say the least. Whilst its unique shape hasn’t just been invented, you’ll be hard-pressed to see too many of them around, unlike all the other ‘standard square gazebos’. Stand out from the crowd and get this very sturdy hexagon gazebo. That’s right, this hexagonal gazebo is waterproof and will, therefore, keep you dry and protected from harsh weather conditions. The manufacturer, ECS Ltd claim this is 100% waterproof and I can clarify that their claim is fully justified. The material is 190gsm which is the weight of the material per square meter of fabric. The roof canopy and sides are then covered with a polyurethane coating which then waterproofs it. It can easily be built in just a couple of minutes due to its concertina frame. The ease of assembling really has made this a great buy also convenient buy. It can be built in as little as a couple of minutes due to the simplicity of the concertina folding frame that just pops out and attaching the sides is straightforward as you just connect them with the velcro fastenings. Much sturdier than the regular square gazebos because the hexagonal shape adds to the strength due to it having more struts in the roofing section and also more legs than most. Having personally constructed a number of these types of structures over the years this style really does feel much stronger than the regular shaped rectangular and square gazebos that are more commonplace on the market. The 6 legs really do add more strength as would be expected due to it having more legs than other sizes and shapes sold by Airwave. The 6 sided shape automatically creates a more windproof gazebo. I always advise people when constructing their gazebo to point a corner section directly into the wind so the wind can pass either side rather than sideways on, as it then adds pressure onto the walled section. The extra sides help the wind to pass around the frame and therefore creating a more streamlined gazebo. Once purchased ensure that you pop back to this site as I have a post that explains how to make your gazebo stronger and more resilient in poor weather. What can this product offer? If you’re looking for any of the following features that this could well be the one you choose and don’t forget there are more colours available. There are 6 colours in total to choose from and they are listed below. Q. Are spare parts available? Q. Can I use this on a hard surface? A. Once again, yes you can. There are feet provided that have holes in should you decide to screw it into decking. Another benefit of having feet means it can sit flat on hard surfaces meaning that it can equally be at home on a hard or soft surface. A. This is a tricky question. A well looked after gazebo like this can be expected to last around 4/5 years. Obviously, a lot depends on how well you treat your gazebo and how well its packed away after use. Q. How good is it in wet weather? A. When the rain begins to pour you can sit back and relax because the rain runs off the canopy exactly as it should do. Check out my final thoughts below. This hexagonal type of gazebo is fast becoming more and more popular due to its elegant and unique shape, together with its 6 legs offering further strength and sturdiness. 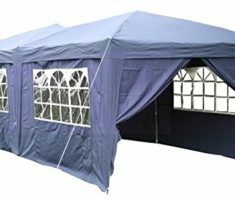 For me, this is definitely in the top 2 of the Airwave gazebo range and over time I honestly believe it could challenge their 2.5 x 2.5 gazebo as being the most popular. The unique selling point for me is the shape, being waterproof, strong and priced up at a pretty realistic price. The 4.5 x 3m Airwave gazebo is an ideal alternative for those who require a slightly larger gazebo than the more regular 2.5m & 3m sizes. 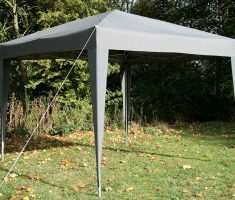 With its waterproof canopy, 4 sides and heavy-duty cross truss roof you can be assured that you have bought a decent quality gazebo that has been designed with the user in mind. Its ability to keep you dry ensures that your event can go ahead or continue with success. Together with the included sides it also means that should the weather take a turn for the worse your event can carry on regardless. This type of gazebo is often used for parties at home and birthday celebrations. 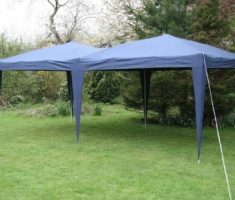 The 190g canopy means that your event will be protected against heavy showers. Simply put, the 190g means the material weighs 190 grams per sq metre and therefore the higher the number generally the more waterproof it will be. Generally, this type of product ranges from 160g to around 260g. 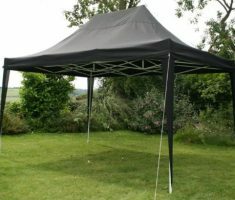 As mentioned above this gazebo has 4 sides that can be easily attached or removed as they have velcro attachments to make adding or removing far easier. All 4 sides are made from the same material as the roof canopy. This gazebo can be constructed on a variety of surfaces as the legs can be easily adjusted. When using on any surface always try and use all parts provided including the guy ropes and pegs. The height of the roof is approximately 10 feet and is self-supporting, therefore there are no centre poles to get in the way. The roof structure is very strong which makes this gazebo even more effective in unpleasant weather conditions, although always exercise common sense when poor weather is forecast. This 4.5m x 3m gazebo has a wide range of reviews on Amazon but my opinion is quite simple. If you’re looking for a pretty sturdy, large gazebo that doesn’t cost a fortune to buy and can protect you from sunshine & showers then this gazebo is more than capable. It comes in a range of very nice colours and can be expected to last a number of years if it’s looked after properly. As mentioned above, please ensure that common sense is applied when deciding whether to construct this gazebo when high winds are blowing a gale. There isn’t a gazebo that is on the market that is indestructible and you will find that you will get a lot more use out your gazebo if you do not subject it to very bad weather on a regular basis. 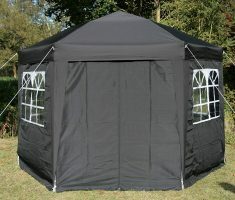 This Gazebo by Airwave can offer protection from wet weather and keep a large area nice and dry for you and your guests. Alternatively, in the summer months, it can be used just as effectively without the sides attached. By taking the sides you will provide further room and make the shelter more accessible. Don’t forget… Allow an extra metre of space around the perimeter of your gazebo to allow for the guy ropes to be staked into the ground for extra strength and stability. How strong is the 6x3m Airwave gazebo? This large gazebo is a nice product at a very fair price and understandably it has its flaws. However, using it in pleasant weather to act as a canopy, then you’ll be absolutely fine. It’s not going to repel very strong winds but can protect you and your party against breezy conditions and gusts, as long as all the parts are used. To receive full effectiveness from this product please ensure you always use all parts provided. When setting up this gazebo it is extremely important to have assistance. Attempting to build this gazebo by yourself is an accident waiting to happen. Don’t get me wrong, this product isn’t difficult to build. However, as it is a concertina style gazebo, all 4 corners need to ideally be stretched out at the same time. How can you do that by yourself? You can’t! Should the weather deteriorate you should always air on the side of caution. Regardless of whether the manufacturers claim them to be indestructible or not, they should not be used in atrocious weather conditions. To ensure your event is kept dry it is important all the sides are attached to the frame with the velcro straps. Incorrect, or a poorly attached waterproof side will leak unless properly attached. 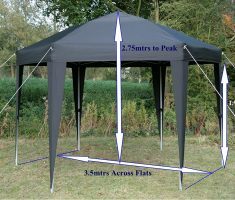 I’ve done as much research as possible and calling upon all my experience with these types of structures, I would recommend the 6x3m Gazebo from Airwave. However, I also recommend that it is not used in wet or breezy conditions if you want to get the greatest longevity out of it. 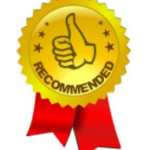 As with any product, there are positives and negatives but as long as you follow my information above , learn from the Amazon reviews and follow the user instructions then you’ll be absolutely fine with this product. The Airwave 3 x 9m Party tent can certainly serve a purpose but unfortunately, it’s not renowned for its ability to stand up to bad weather. 4 different colours provide you with a nice conundrum, as all 4 colours look pretty smart. The white tent looks especially smart when built and can be used for more formal parties like wedding receptions and christening type events. 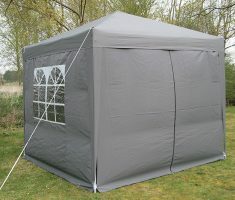 The tent is described as waterproof, but personally, at 120gsm I would describe it as more showerproof than waterproof. Don’t forget though, you buying this party tent for the summer months so all being well there won’t be anything more than a quick shower. 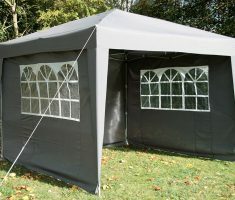 Party Tents are great as they are large enclosures that unite the entire party all in one room. 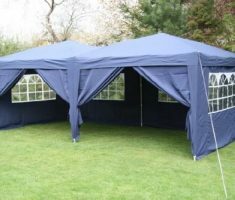 So what better than buying a party gazebo that has 8 sides that can ensure that when it starts getting late you can keep out the drafts and the bugs by rolling down the sides. You can use this party tent on a wide range of surfaces, however, wherever you decide to station it you must be able to use all strengthening parts such as the guy ropes, tent pegs, and wind bars. This is really easy to build but admittedly it will take 4 people to construct this tent. I’m advising 4 people to build it purely down to the size of it and expecting 2 people to build it may result in damage or injury. If you require a fair weather, large canopy with sides then this is perfect for the job. Highly recommended by the team for its build quality and durability. If you have any Airwave questions, ask us in the comments below! 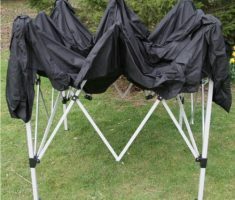 Can I get a replacement frame for a 3x3m airwave gazebo? 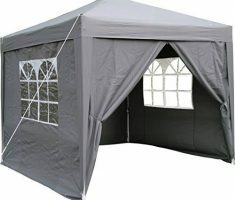 Where can one order additional side pieces for the gazebos? I checked many online stores but could neither find contact information for airwave, nor offers for replacement parts.